Pullman Scholar Alumna Valarie King-Bailey, University of Wisconsin – Madison, ’82, summed up the importance of engineers perfectly, “look around you, everything around you is courtesy of an engineer.” The air we breathe, the roads we travel on, the water we drink; an engineer has done something with it. 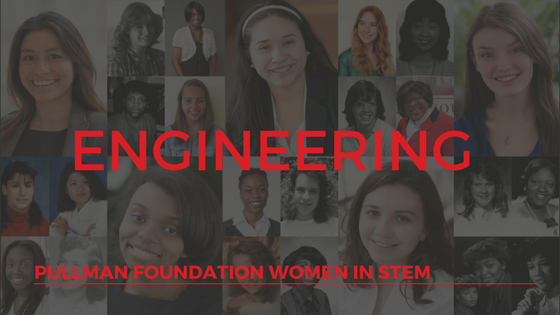 With that in mind, the Foundation is proud of the 13% of Pullman Women in STEM (around 250) who study or studied some type of engineering. We have seven current female engineer scholars, and we are excited to see where their studies take them. There are four main branches of engineering with hundreds of specialties. Pullman Women have majored in around 18 different types of engineering; chemical (52), general (47), mechanical(23), and industrial engineering (19) having the most. According to the National Science Board, the areas of engineering with the most women are environmental engineers (38% of full workforce), chemical engineers (23%), and civil/architectural/sanitary (18%). Stay tuned this week for a three-part podcast series featuring current scholar Julissa Garcia, University of Illinois at Chicago, ’18, interviewing Valarie King-Bailey. They talk about what it’s really like to be a female engineer. If you are in the engineering field and are a member of the Pullman Scholar Community, please contact Katie Desir to share your story. Listen to episode one of three Women in Engineering podcast, “An Intro Into a Profession With Great Impact,” here. Listen to episode two of three Women in Engineering podcast, “A Real Account of Being a Female Engineer,” here. Listen to episode three of three Women in Engineering podcast, “What It Takes to Be a Success,” here.